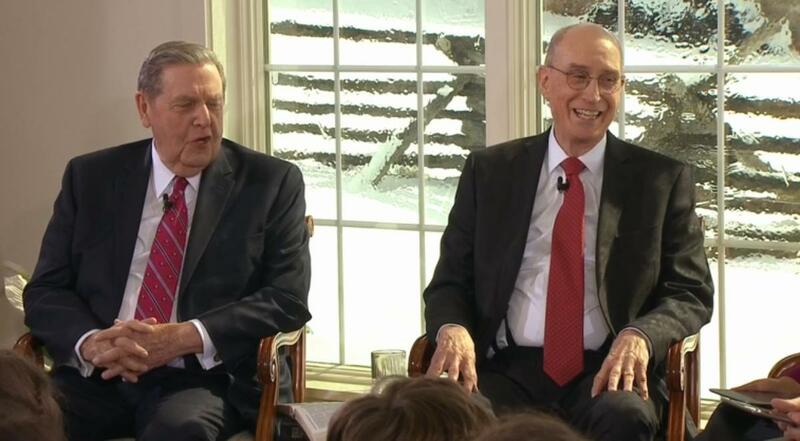 That was the challenge given Saturday to the youth of The Church of Jesus Christ of Latter-day Saints by President Henry B. Eyring, first counselor in the First Presidency, during a special “Face to Face” broadcast originating from Palmyra, New York. “As you accept and act upon this invitation, you will find that not only will answers come, but you will also establish a pattern of acquiring spiritual knowledge that will bless you for the rest of your life,” the LDS leader taught. Held on a Saturday afternoon — in order to allow as many youth as possible in different areas of the world to join in — just yards away from important historic sites for members of the LDS Church, President Eyring, along with Elder Jeffrey R. Holland of the Quorum of the Twelve Apostles, spent an hour and a half sharing insight and answering questions submitted by LDS youth around the globe. “We are here … out of love for you and love for the Lord and to declare that this is the truth,” Elder Holland said. Thousands of youth around the world tuned in to the broadcast originating inside the visitors’ center on the Church-owned property where two youth, Kombi and Natasha, led a live discussion with the two leaders. A small group of youth from the Palmyra area filled the visitors’ center while a youth group from Plymouth, England, and another group from Johannesburg, South Africa, participated virtually.